צד אחד דמותה של מלכת אליזבת' השניה והמילים "Elizabeth II Niue Two Dollars"
הפוך פנדות, מבוגר ותינוק אוכלים במבוק עם יער במבוק והרים ברקע, והמילים, "999Fine Silver One Troy Ounce" יחד עם ראשי תיבות של האמן. דמותה של מלכת אליזבת' השניה והמילים "Elizabeth II Niue Two Dollars"
פנדות, מבוגר ותינוק אוכלים במבוק עם יער במבוק והרים ברקע, והמילים, "999Fine Silver One Troy Ounce" יחד עם ראשי תיבות של האמן. מטבע כסף פנדה ייחודי מאת Niue Silver Gold Bull שנת 2017 משקל אונקיה Buy this stunning 999 pure silver coin featuring the world famous Chinese Panda at the best price through our online store. Your order may qualify for free shipping. The Chinese panda bear is one of the world's most recognizable and beloved animals. Its distinctive black and white colouration has made the panda a national symbol for China. Although considered a carnivore, bamboo makes up over 99% of the panda's diet. The panda is currently considered a vulnerable species, with only a few thousand alive today. 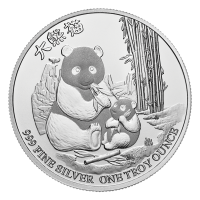 The reverse of this coin features an adult and baby panda happily munching on their favourite food, bamboo. They are surrounded by a highly detailed bamboo forest, with hills in the background. The top of the field is engraved with Chinese characters meaning Giant Panda. The obverse displays the Ian Rank-Broadley effigy of Queen Elizabeth II. For added security, the obverse has been engraved with radial lines as an anti-counterfeiting measure. This coin features terrific value, beautiful design and the security of a sovereign minted coin. Add it to your collection today!